With a new year brings new resolutions! With that in mind, we are excited share with our readers the launch of the “Macy’s Million Dollar Makeover” with Macy’s Style Expert Clinton Kelly! This is no ordinary makeover competition though, Clinton won't just be transforming your wardrobe; he will help to transform your work, your home, your entire life. “Macy’s Million Dollar Makeover is my typical makeover on steroids,” said Clinton Kelly, style expert for Macy’s and co-host of TLC’s What Not to Wear. “The winner will not only get some quality time with me to update their look, but they will get a truly life-changing experience. From fashion to finances to fitness, they will undergo a complete life transformation." The excitement has already begun! Fans across the nation have started submitting photos and videos here describing why they deserve this life-changing makeover. 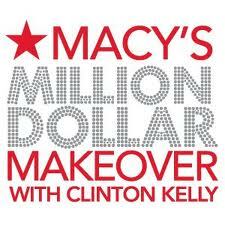 Macy’s will choose eight contestants who will get a personalized makeover from Clinton Kelly himself. Then, the fun really begins as America helps to decide who wins the grand prize ultimate makeover, worth $1 Million! Entries may be submitted at http://on.fb.me/macysmilliondollarmakeover from now through January 31, 2011. Entrants must “like” Macy’s on Facebook to access the contest application, and will be required to submit either a video or picture. Following the nationwide entry period, eight contestants will be selected in early February and will undergo a makeover session with Clinton. Each contestant’s personal story and makeover will be filmed and posted to http://on.fb.me/macysmilliondollarmakeover for an open voting period that begins in March. Two videos will be posted each week and the video with the most votes each week will proceed to the semi-finals in April. The top two videos will compete in a finals round – with the victor winning the million dollar makeover. “Macy’s Million Dollar Makeover” with Clinton Kelly is open to legal residents of the United States who are 18 years of age or older. A $50 Macy's Gift Card ! The winner (selected by Random.org) has been emailed ! Leave us a comment and tell us if you think you need a make over and if so why. I will be using a random number generator to select the winner. Contest ends at 11:59pm CST on 1/30/11. If the prize is not claimed in 48 hours a new winner will be chosen.Contest open to U.S. residents only. I need a makeover. I am stuck in the 90"s.
I need a makeover since my clothes are outdated! I need a wardrobe makeover because I haven't bought any clothes in three years. After being a stay at home Mom for a number of years, I'm just getting ready to go back into the workforce. I could really use this makeover as a confidence booster. I think i need a makeover because I need to liven up my makeup art. I am 100% SURE I need a makeover! REALLY BAD! Thanks for the chance! I think I need a makeover because I'm stuck in a jeans and a tee rut! I do not need a make over. I am fine just the way that I am. I don't need a makeover. As a mommy who is going back to work in September I could really use a spruce for my professional wear. I need a makeover because I look tired and frumpy. I don't need a makeover. I'm pretty happy with my life the way it is. I like you on Facebook. My username is Mary Happymommy. I need a wardrobe makeover. Heven't bought new clothing in years. Yes, I need a makeover! I am starting to look my age and don't like it! Yeah I could Use a Makeover especially for my hair it's been the same forever! I could really use a wardrobe makeover to cheer up and help with new offered position. I need a makeover...why?...Have you seen me?THANKS for the AWESOME GIVEAWAY!!! oh yes! Been fighting cancer the last 5 months - surgery, treatment and isolation. need a makeover in more ways than you can imagine! I need a makeover, because I have clothes I have had since my son was younger. I need a makeover so bad! I am 9 months pregnant and have no clothes! Thanks for this chance! I definitely could use a makeover. At work I've crossed the line from casual to sloppy and I know it. I'm just not sure how to get back to work appropriate. I would love a makeover! I need it because after having my daughter everything just doesn't fit the same! I think I need a makeover because I am tired of wearing my hair up in a little clip day in and day out. I am so in need of something fresh and new and easy to care for. Your button is posted on my left-hand sidebar under "Sew Buttons"
I absolutely need a makeover-- I have zero fashion sense. If it were up to me, I would wear black pants and a cardigan to work everyday. January 15, 2011 at 9:40 AM This comment has been removed by the author. I need a makeover becuase I lost 65 pounds 1.5 years ago and I am still wearing my "fat" clothes! Help!!! I could really use this makeover, from my wardrobe to my house, that would be a great change! I love change! I could definitely use a makeover! I've dropped a few sizes (and am still losing weight) and need some nice new clothes. Also, I've had the same hairstyle for years and could use a professional to spice it up a bit! I need a makeover because I am bor-ing. It's not that I try to be boring, but I know I am not excting. Long, straight hair which doesn't cooperate when I try to do anything different with it, many pair of the exact same pants in different colors, etc. I could certainly use a makeover. I'm not really the type that buys a lot of new clothes so I could use new ones. I definitely need a makeover; my style is very 1988! I need a make-over because I have been a SAHM for 3 years and don't do much for myself - all about the kids and the hubby that works! I desperately need a makeover and am out of touch with what's in style. I could use a makeover because I always feel I just pay bills with nothing left over. Anyone else who does win, good luck! Like life in a house of blue on FB. Sure I do ... maybe something other than my standard five minute face. I need a makeover because I haven't changed my hairstyle in decades, my closet is full of t-shirts and sweats. I don't really have any clothing that would be appropriate to wear if I needed to look nice, and I don't know what styles I should be looking for that will look best on me. I've had the same clothes style and hair style since birth! I would love to win a makeover for my hair, because it is graying and getting so dull. I certainly do need a makeover because I don't usually pay a lot of attention to fashion and it shows! If you took one look in my closet, you'd know why I need a makeover. I don't think I'd like a public one though. I need a makeover! I'm finishing grad school at the end of the semester and I need a more professional wardrobe for job interviews! I could use one, sure. A new wardrobe would be especially nice. i sure could use one... i have no sense of style and i always look frumpy. I could use a make over because I have started my practicum and I need stylish clothes other than my usual jeans and shirt. Budget is tight so this would really help! Yes. My hair has been long straight and boring for 15 years. I could use a change. I need a makeover because my clothing is sadly outdated and I need to get in shape.